I have to admit, watching movies with me isn’t always fun. You’re probably thinking my rich and insightful commentary would only enhance one’s viewing pleasure. Strangely, Denise says that my critiques of a film’s depiction of human behavior and historical accuracy can be annoying. She often responds to my observations about the storyline’s authenticity and realism with, “I know it’s not accurate. It’s fiction. It’s just entertainment. Stop over thinking it.” Me, overthink something? When has that ever happened? This dynamic came up recently as we watched the 1980’s comedy The Gods Must Be Crazy. If you aren’t familiar with the film, the mock documentary format portrays the Eden-like existence of a group of African tribesman. According to the narrator, the people are “the most contented people in the world. They have no crime, no punishment, no violence, no laws, no police, judges, rulers or bosses. They believe that the gods put only good and useful things on the earth for them to use.” Their idyllic existence is compromised when a Coke bottle drops into their community from a passing airplane. For the first time, the harmonious group experiences competitive disharmony and violence surrounding the bottle. The solution is obvious. Get rid of the evil bottle and the group will return to its former peace. Spoiler Alert: That’s exactly what happens. I confess I had one of those critical moments during the opening scenes of the movie. Even though the story is fiction and for entertainment purposes only (as per Denise’s intervention), the premise that drives the plot illustrates several common but troubling mistruths. Check it out: The people are happy and content. No fighting. No misbehavior. Their simple polytheistic religion is working for them beautifully. 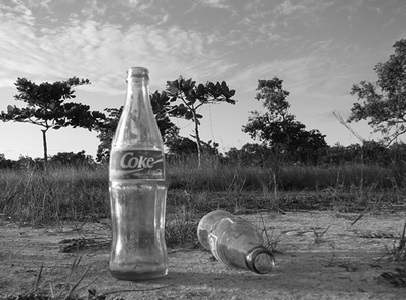 A Coke bottle enters and brings violence, estranged relationships and a crisis of faith…hence the title. The storyline keeps us engaged because on some level we believe that well-timed outside factors can explain and excuse why we act badly. The logic leads us to seek ways to remove the Coke bottles of our discontent at the expense of dealing with the real problems that reside in our hearts. Blaming something or someone other than ourselves is deeply imbedded in our souls. For many of us, the speed of sound or light is eclipsed by the speed with which we can excuse ourselves for our failures. Consider the following common life excuses: How many times have you heard people explain their unwillingness to attend church as the natural result of being forced to go as children? Or how often does someone blame his/her overeating on being made to “clean your plate” as a child? Both of these explanations usually go unchallenged because they intuitively make sense. But think about it for a minute: Being forced to go to church when people don’t want to makes them hate church…but being forced to eat food they don’t want to makes people love food too much? I think I get it. It’s wrong but I get it. We blame as naturally as we breathe. Read Genesis chapter 3 and you’ll see the first instance of sin driven blame. Adam and Eve disobey God’s clear directive about the forbidden fruit. When confronted about their sin, Adam blames Eve (and God) while Eve blames the Serpent. Notice that God isn’t swayed. Our spontaneous blame defense doesn’t neutralize the consequences. When Bud was young he sometimes brought home less than stellar report cards. The excuses would begin immediately. I would hold up his grade card and check to see if the excuses were moving his grades up. Nope. The same bad grades remained. I would ask him to try another excuse. Blame the teachers and the school and the football coach and your Dad’s unreasonably high expectations. Did those D’s morph into A’s? Not surprisingly, they never did. I believe the answer lies in telling myself the truth about who I am and the brokenness that lies in my soul. Truth #1: Coke bottles or unsympathetic people do not make me do wrong. I carry around an active dead man who is capable of all sorts of mischief. Truth #2. Left to myself, I will self-destruct rather than self-actualize. Really, even alone on a deserted island I will cause problems. Truth #3. My only hope for confronting that broken dead part of me is faith in Christ. Romans 3: 23-26 sets the record straight: “For everyone has sinned; we all fall short of God’s glory. Yet God, with undeserved kindness, declares that we are righteous. He did this through Christ Jesus when He freed us from the penalty for our sins. For God presented Jesus as the sacrifice for sin. People are made right with God when they believe that Jesus sacrificed His life, shedding His blood. This sacrifice shows that God was being fair when He held back and did not punish those who sinned in times past, for He was looking ahead and including them in what He would do in this present time. God did this to demonstrate His righteousness, for He Himself is fair and just, and He declares sinners to be right in His sight when they believe in Jesus.” And while you’ve got your Bible open to Romans, notice these two phrases in 1:18-2:11: “so that men are without excuse” and “therefore you have no excuse”. Believe it. Let go of the excuses. Take a look in the mirror instead. It ain’t pretty. Well, shucks…have an awesome fortnight. It only comes around twice a month. There is no excuse for not enjoying it. Really. Zero excuses. I recently counseled a young man who had egregiously flunked out of college. He also quit his last three menial jobs and now spends all night playing video games and all day sleeping. Surprisingly, he had managed to take chronic low-achievement to acute no-achievement in less than two years. He told me that his main problem was fear of failure. He explained that he lives with an unrelenting dread that he will fail his parents’ and siblings’ high expectations. Apparently, this fear of failure has kept him stuck in a spinning loop of…well…failure. Admittedly, fear of failure is high on my list of bewildering but popular counseling issues. I view it with the same skeptical eye as struggles with self-esteem and the right to unconditional acceptance. When I hear all three of those conditions in the same counseling session I have to wrap my head with duct tape to keep it from exploding. But for the purpose of this Fortnight we’ll only consider the first one: The dreaded fear of failure. I admit I have had a longstanding relationship with the fear of failure. I truly have not viewed it as an enemy or a stumbling block. Rather, I consider it a blessing. I look back at my formative years and am grateful for the experiences that nurtured that fear within me. During my senior year in high school I had a profound encounter with a guidance counselor who made a huge difference in my life. I remember the event like it was yesterday. The counselor looked at my SAT scores and my cumulative grade point average and pronounced me overwhelmingly average. I was troubled enough by her assessment to ask, “Do people like me go to college? Should I even try?” She coolly replied, “I don’t know. You might be able to pull it off. Whether or not you try is up to you.” I admit I was taken aback by her flatly discouraging input. I assumed that guidance counselors were supposed to be positive and reassuring. Even though she was neither, I credit this counselor with stirring my heart toward a healthy fear that kept me through three degree programs. The fear of failure was a motivating package that disciplined my efforts in higher education. Without that healthy and unrelenting fear, I would have failed. •	Fear generally makes us better. I’m not talking about paralyzing terror. I’m talking about a good healthy truth-based fear. When asked if he was ever afraid on the mound, Hall of Fame pitcher, Dennis Eckersley said without hesitation, “Every single time. Lord help me if I’m not afraid out there.” Eck’s fear was firmly grounded in reality. As a closer, he was always pitching with the game on the line. He understood the havoc that a major league hitter could produce with a bat in his hands. A wicked backdoor slider made Eckersley good. An abiding, informed fear made him great. •	People who have no fear of failure are either crazy reckless or their dreams are too tiny. If you can stumble over the bar, the bar is set too low. We all have varying capacities for accomplishment. You won’t know what you’re capable of till you blow it…a lot. •	We do our children a disservice when we attempt to insulate them from the pain of failure. In the real world, everybody doesn’t always win. Those participant trophies your child “won” are placebos. 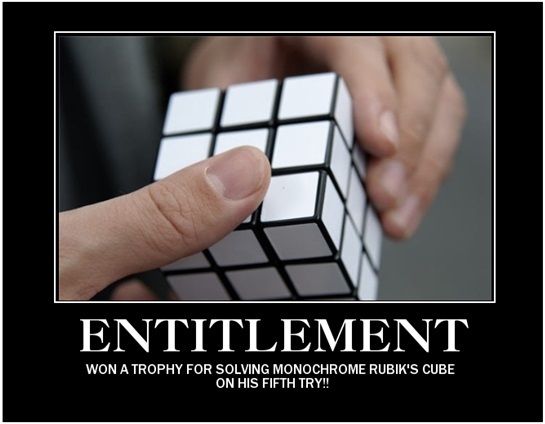 They perpetuate the lie that hard work and sacrifice are unnecessary for gaining a reward. Success is not free. Failure is also costly but in a different way. •	Fear is good, but failure might be even better. I tell my new counselors that if they aren’t making therapeutic errors, they aren’t working hard enough. By the same token, repeatedly crashing and never figuring out where it broke down is foolish. Failure should shape our solutions. Doing the same thing over and over and expecting different results is still the definition of you-know-what. He didn’t make a return appointment. But maybe someday he will look back with affection at the insensitive counselor who told him what he didn’t want to hear. For years after my encounter with the discouraging guidance counselor I harbored an I’ll-show-her grudge. After I grew up a little I realized that she was right. I was average. My attitude and effort put me dead center in the middle of mediocre. When I stopped feeling indignant and started feeling scared, things changed. Scared was a whole lot more productive than being offended. Stay scared, my friends. Stay very afraid. But hey, get out there and have an above average fortnight. Enjoy every minute of it with appropriate fear and trembling.